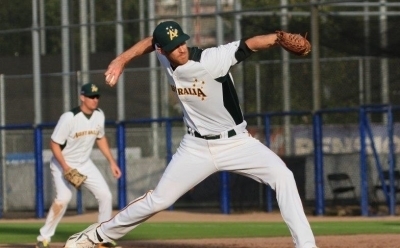 I had always pitched over the top throughout my professional career in the US but in 2013 during the Australian Baseball League season I started getting some recurrent shoulder pain that I couldn't seem to get on top of. At the time I was playing with Cameron Lamb who was another sidearm pitcher and he got me to try dropping down. Instantly I was able to throw without pain and I then took this to the mound over the next few games. It enabled me to pitch out the season painfree and I found I started to get a lot more movement on the ball. Ever since then I have stuck with the sidearm action and feel it has made me a more effective pitcher. The big advantage for me is that I finally have a little movement on my fastball. From over the top my fastball was always dead straight and I really didn't have an effective 2 seamer. Although I still don't get great movement I at least now get something. The angle has also made my slider a much more effective pitch. It is sharper and I find I have a lot more command of the pitch. Since I made the change I have definitely had some more success on the field and I feel some of that is attributed the increased movement I get on my pitches. Throughout my pro career I was always getting sore in either the elbow or shoulder and had I known I could pitch painfree from a slightly lower angle I probably would have made the change a little earlier. If they are going to make the change they need to commit to it and take their time in learning the craft properly. It takes time for your body to adjust and for you to find the right arm angle that works for you. Its not something you should change overnight. I think taking it to the bullpen first and slowly building towards games is the safe way to go about it. From a mechanical perspective the big thing that has helped me is keeping an eye on where my front foot lands. Its very easy to start landing too closed and then having to throw across your body. It makes hitting the outside corner to rightie almost impossible. If I find myself missing arm side consistently this is usually the first thing I look at. I've found landing straight on or even slightly open allows me to hit both sides of the plate and actually results in better movement on all my pitches. I throw a 4 seam/2 seam fastball, slider and changeup. Velocity has generally sat in the mid 80s over the past few seasons. My velocity has been a little lower since dropping down but I feel the extra movement has been well worth the sacrifice for me. Obviously I pitch differently to hitters based on the situation and what I see but generally speaking I throw lots of 2 seamers to arm side (inside to righties, away to lefties) and sliders to the other side of the plate. I have found a backdoor slider to the lefties to be a very effective pitch when I can locate it. I have also had good success with hitters chasing fastballs up in 2 strike counts. I think hitters have hard time laying off this pitch when it come from a lower arm slot. My favourite part about throwing sidearm is that it has made pitching a little more exciting again. After throwing from the same angle for such a long time I've now had to re-learn how to pitch. It has changed the way I approach hitters and I have more confidence in pitching to contact with the hope of getting a groundball. Throwing sidearm is definitely still a work in progress but thus far I am enjoying the challenge.